THERE’S EVEN MORE water on the moon than we previously thought, according to new analysis of tiny glass beads left over from ancient volcanic eruptions. In a new study published today in Nature Geoscience, scientists reexamined the Apollo samples and used more recent satellite data to look for signs of water-bearing beads elsewhere on the moon. They found that the volcanic deposits are indeed widespread, which suggests that the material inside the moon is wetter than previously thought. “The fact that they see this feature associated with the glasses tells us that there was indeed quite a bit of water in the interior of the moon when these volcanic eruptions were occurring,” says Anthony Colaprete, a NASA scientist who reviewed the paper. Yes, but only very recently. Scientists used to think the entire moon was bone-dry. But in 2008, researchers examined those glass beads from the Apollo samples and found the first known trace amounts of water. From that point on, lunar water discoveries started gushing. In 2009, NASA crashed a rocket and a satellite into a crater on the moon’s south pole, in the hopes of picking up additional watery evidence. The crashes gave off signatures associated with water ice and hydroxyl—a highly reactive molecule associated with water. And in 2010, scientists looked closer at other collected moon rocks and found more signatures of water in a mineral called apatite. That’s when geologists began suspecting that the moon holds hidden reservoirs locked in its rocks. If you were to take all of the water in the moon’s interior, it would create a one-yard-deep ocean covering the entire surface, geologist Francis McCubbin estimated at the time. 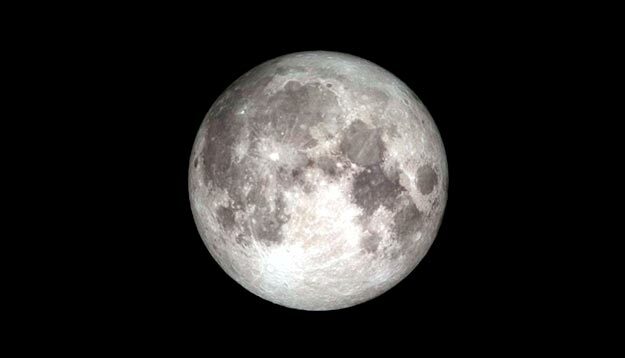 For their study, Ralph Milliken of Brown University and Shuai Li at the University of Hawaii wanted to find out more about the amount of water inside the moon. (See rare pictures of the moon captured by Apollo astronauts.) The study is one of the first to try and answer this question using satellite mapping of volcanic debris called pyroclastic flows.